My name is Greg Price, and this is the first of a series of posts that I will do for waveslive.com. Here are some things to know: I’m in my 35th year of engineering in the live, studio, and broadcast mediums, which have seen me engineering everyone from Pablo Cruise to Ozzy Osbourne, and lots in between. I recently became a Waves live sound product specialist. And, I use Waves plugins for large PA systems and big rock shows. My purpose here is to focus on the live sound applications of Waves tools. I have said it before, and I’ll say it again: “My mixes have never sounded this good in 35 years”. Waves tools give me the ability to dream, and “see” the sound in my mind, and then produce it in the live environment. Waves are mandatory in my studio and broadcast projects as well—and it doesn’t matter what DAW, console, or system I am using. Today, I want to share with you the first steps I take in all projects I start. 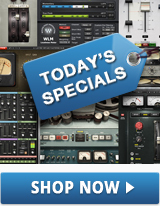 My first go-to tools are the Q10 Paragraphic EQ, SSL 4000 Collection, and the Renaissance plugins. These tools work for me on any type of DAW, console, Pro Tools session, or live mix that I am building. It is very important to realize that the Waves tools I use for my live show projects, translate to all my other media mixes. That said, let’s take a deeper look at the SSL 4000 Collection. The SSL G-Channel strip is one of my favorites and a must for my mixes; in fact, it replaces most of the strips on my console. The included presets by Chris Lord-Alge and other great engineers give you a great starting point on a wide variety of inputs, groups, and stereo buss applications. I usually use the mic-pres on my console; however, I like the texture and character that the G-Channel gives me. Drums, bass guitar, keyboards, and vocals all benefit from this texture. I especially like it on Ozzy’s vocal, for its texture and tonality. There is a great dynamics section on this strip as well. For vocals, having SSL-style dynamics is just one more weapon at your finger tips. I start my vocal modeling in the Filter section and trim a little high/low pass filtering the vocal. Ozzy’s stage is loud, so I trim off the low end at 120 Hz; I also like to take off a little top, so I trim the high end down to 12 kHz. From there, I like the SSL high end sound, so 8K +3 dB in the HF is just right. The LMF is great for sweeping that range. -4 @ 300 Hz with a Q of 1.5 is where I usually end up; however, I sweep the LMF on a gig-by-gig, room-by-room basis. With a metal vocal, HMF is my savior. I get in at 1.5 kHz @ Q of 3 and sweep up to 3.5 kHz. The harshness is gone from the vocal; now I can move on to the dynamics. I have compression downstream from this strip; however, I do like to engage a little 4:1 comping here. FATK is in with only maybe 3 dB of gain reduction. The gate is a must for a loud stage. So I set that in as well. From here, I go down stream to the C6, driving its input with the output fader, and I can phase reverse. By the way, when I use the SSL 4000 plugins, the Analog button is always in the “on” position. That’s my technique for vocals. I use the G-Channel for drums, cymbals, keys, and really I like to start with it, before going to other plugins. Next, I like to go to the SSL E-Channel, another channel plugin that I use all over my mix. I particularly like it on the snare drum, top and bottom, as well as toms; but for bass guitar, the SSL E-Channel really rocks my world. After loading the Chris Lord-Alge bass preset, I work the high/low pass filter section to fit my player. I trim the top end to around 4K. I try to find a general top trim that covers all the basses. If a certain bass guitar is a little brighter than another, I will trim to 3K for that bass guitar only, and then use the console’s snapshot to program the filter move for that bass guitar in that song. The bottom trim is 60 Hz. I feel 60 Hz tightens the bottom and gives me room to boost the bottom end feel of the bass guitar on the LF EQ. I like to sweep from 50 Hz to 100 Hz @ +6 dB. That really drives the bottom end of the bass and gives me a sense of the low end sweet spot in the room. I always use the bell setting for the LF & HF EQ. I prefer the bell over the shelving. The combination of the bell and high/low pass filtering is a technique and sound I like.